Yesterday I went out to test my newly built c-pole antenna. I have used one in the past but found out it had some construction errors - the effect of which was somehow hidden by the balun I added ( a couple of coax turns on an FT240 core). The balun did get extremely hot even with 100w - a sign something was wrong - and once I replaced it, the SWR went through the roof. I used an online calculator (http://svrc.org/cpole/) that turns out to give the wrong dimensions - at least for 40m. I did not notice it before but when using it again for my new version I found that adding all the various dimensions resulted in significantly less wire than the calculator specified as "total wire needed for antenna". So considerable tweaking in the field was necessary to get the antenna resonant (think of adding more than 1 meter of wire to one end). This time I used two short cheap and light fiberglass fishing poles for the horizontal spreaders. I cut them to the right length and ran the antenna wire through them. I used the caps on both ends to position the wire - making a hole in each cap and a knot in the antenna wire at each cap. Apart from their low weight and high stiffness an extra advantage over the PVC pipe I used before is the fact that the fishing pole can be (partly) retracted - decreasing the size of the collapsed antenna. To complete the antenna I constructed a W2DU style balun. It is light and simple and still provides more than 20dB common mode suppression at 7Mhz (if you use the right beads). The first time I brought it out I used all my time to get the dimensions right. In the end I got the antenna to dip around 7.1 Mhz with an impedance of something like 49 Ohm - perfect. The next opportunity to go out was yesterday. I tried the antenna from a nature reserve, to see if I could get a decent amount of contacts on 40m. It was too early to get any serious DX but I did log 150 contacts up to 2500km. So it did seem to tx and rx. The c-pole is an addition to a range of antennas I have for /P operation on 40m. 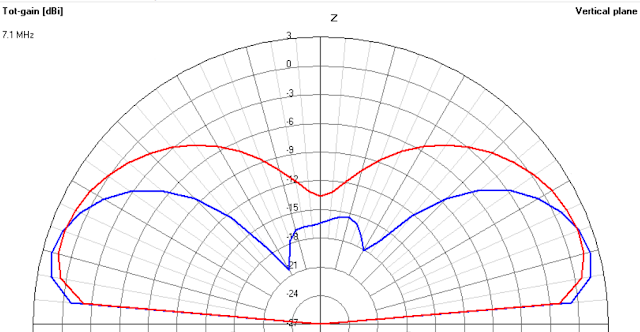 I mostly use either an (almost) vertical end fed half wave or an inverted V - depending on how much space I have to set up the antenna and what kind of radiation pattern I am looking for (more NVIS or more dx). The final option I have is a delta loop (more or less corner fed - so vertically polarised). The loop is more complex to set up than the others though. All these antennas can be used when I have my 18m Spiderbeam pole with me. 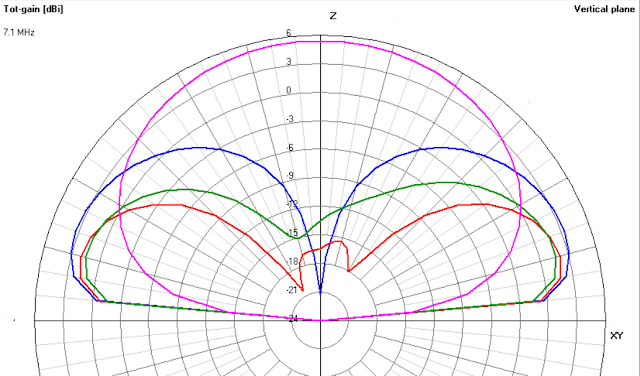 They are all omni-directional but have a different radiation pattern in the vertical plane - with the vertical, c-pole and delta loop in one category and the inverted V dipole in another. 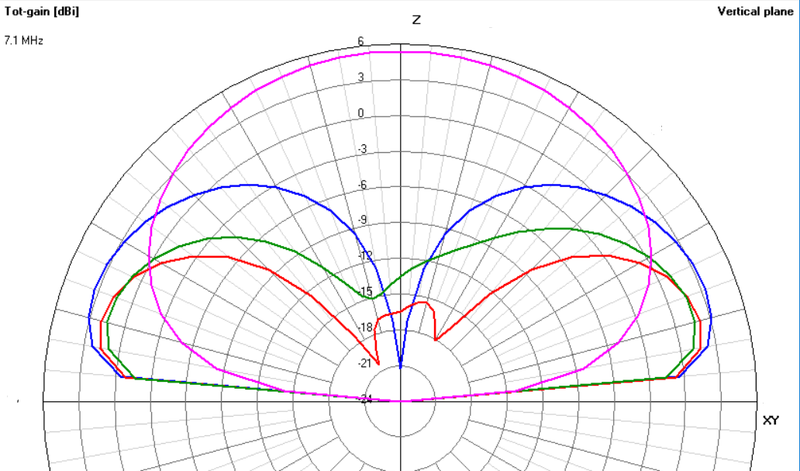 Pink is the inverted V. It has nice NVIS qualities with a lot of gain on high angles of radiation (5.4 dBi straight up) but at a takeoff angle of 15 degrees only -5dBi. Green is the (almost) vertical end fed half wave. A bit less pronounced than the delta loop. It has a max gain of 1.6 dBI at 15 degrees. Red is the new C-pole. It has a max gain of 2.1 dBi at 15 degrees. Looking at the three antennas with a "dx profile", the delta loop is the clear winner. 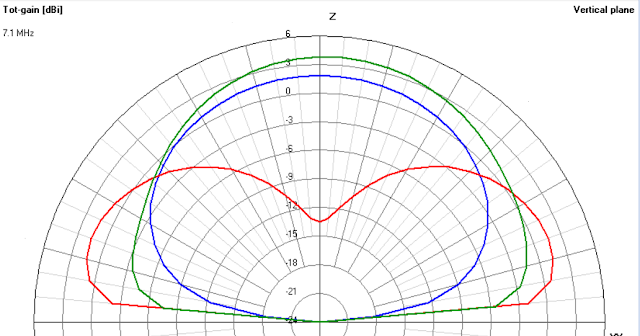 It has more gain on low angles but also significantly more gain than the other two at higher angles. It is a bit more work to set up though and needs space. The reason I started looking at my c-pole again is that there are situations in which my 18m pole is not available (I could not take it, or - in a team expedition - it is in use with another antenna). The next option I have then is my 12m Spiderbeam pole. Now things are a bit different. For one, the delta loop is not an option anymore. The half wave vertical is also out of the question. That one becomes a sloping end fed half wave with quite a different behaviour. Blue is the inverted V. It is still radiating most of its energy up at high angles but the max gain is now down to 1.8 dBi. Gain at 15 degrees is down to -9dB. Red is the c-pole. Max gain is now 1.7 dBi at 20 degrees and 1.4 dBi at 15 degrees. The C-pole does not seem to suffer that much from the change in height. It actually performs a bit better on the higher angles without losing much on the lower angles. Red is the C-Pole with the top at about 11.5m and Blue is the same antenna with the top at about 16.5m. At low angles almost no difference but at 45 degrees the lower C-pole has 7 dB more gain (at 60 degrees the difference adds up to 13 dB). Looking at the radiation shape of the higher C-pole (in blue) you can see a central lobe that you can expect to grow when you put the antenna even higher - and it will. However height is not a variable I can influence that much. It will be somewhere between these two extremes. 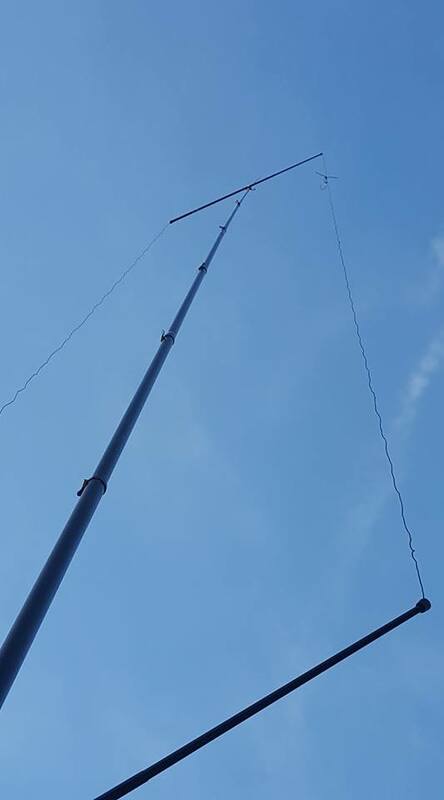 The practical test showed that the antenna works - I logged a lot of contacts with good reports and the SWR is now perfect - and the model shows it is a decent addition to my set of antennas, especially when I am constrained in height.